In addition to reading, writing and arithmetic, this semester, NMC students are collecting food donations, swinging hammers and X-raying teeth. Food for Thought food drive – The fourth annual event organized by NMC business students runs through November 19. 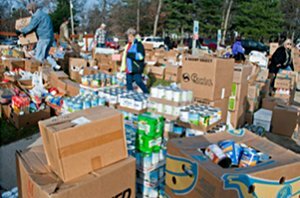 Regional pantries have come to rely on the event, which seeks to collect enough non-perishable food and hygiene products to stock more than 45 pantries throughout northwest Michigan through the holiday season. “It’s not just a blessing for some pantries, it is survival,” said Val Stone with the Northwest Food Coalition. Donations are accepted on campus and at several community collection sites, including at Technology Exploration Day this Saturday, Nov. 12, from 10 a.m. to 3 p.m. at the Parsons-Stulen Building. Dental X-rays – Dental assistant students began their annual free X-ray project this week. 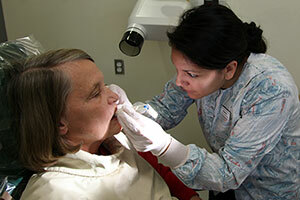 Patients referred by their dentist may receive a free set of complete X-rays, valued at up to $200 per set. Instructor Beckie Wooters expects between 80 and 90 patients to take advantage before it wraps up Dec. 8. “We get a lot of patients that are returned to us when they’re due for these X-rays, because they enjoy the opportunity to meet our students,” Wooters said. The program has been offered since at least 1995. Students will also be using new digital equipment in all three screening rooms, enabling them to e-mail X-rays directly to patients’ dentists. The digital images mean less radiation exposure for patients, too, Wooters said. 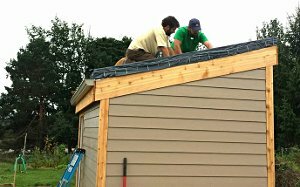 Garden shed – In October, Construction Technology students finished building an 8-by-12-foot storage shed on the property of the non-profit TC Community Garden, located at the Grand Traverse Commons. Previously, the garden had a small, old shed which didn’t offer sufficient space or security, garden president Kimberly Conaghan said. “We’ll be able to upgrade our tools and have a lot more autonomy to store our own equipment,” she said. The shed’s green roof and permeable surrounding pavement integrates with an adjacent rain garden, making the whole project a demonstration of the garden’s mission of education and sustainability. “There’s kind of a cycle that’s happening there with green infrastructure,” said Conaghan, who estimated the value of materials and labor at $25,000. It’s the second shed students have built; the first went up at the Grand Traverse Conservation District in 2015. NMC alumnus Nate Griswold of green building company Inhabitect assisted with the project, too.